Painted circa 1963. This work is unique. F. Feldman and J. Schellmann, Andy Warhol Prints: A Catalogue Raisonné 1962-1987, New York, 1997, p. 44, no. I.5 (another example illustrated). Warhol devoted much of the year 1963 to producing images of profound violence and morbidity. Many of the source images that Warhol used were found in movie magazines or cheap tabloids, while others were provided by friends who had access to police or news-agency photographs. 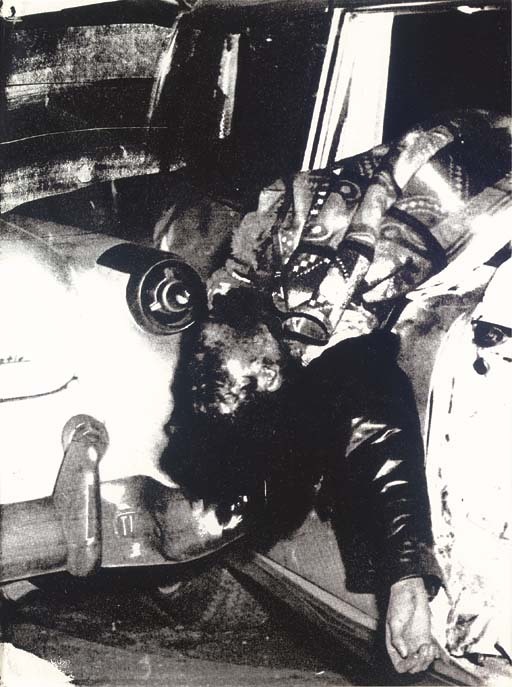 Warhol's subjects, like the present work Ambulance Disaster are graphic and disturbing; bodies are scattered among mangled vehicles throughout the scenes not yet covered by the discreet white coroner's sheet. The images, some have argued, reflect Warhol's own fear and fascination with accidental death. Yet the mechanical process of replicating the image, and the monotonous repetitive application of the screen desensitizes the viewer to tragedy. The works, however banal their presentation, commodify American violence. According to Peter Halley, "The Disasters constitute a key moment in [Warhol's] work. Suddenly the sassy young man, who had burst on the scene with images of Campbell's Soup, Coca-Cola, dollar bills, and movie stars, was turning his attention to the death-obsessed underbelly of American life. These paintings must have been a tremendous shock when they first appeared, revealing that Pop Art was much more than an ironic joke for Warhol. With the Disasters, Warhol succeeded in separating himself from the other Pop artists, who, for the most part, continued to occupy themselves with the mechanics of mass-market image-making. He defined himself as an artist operating on a truly ambitious stage, willing to take on the big issues of human existence -mortality, the randomness of life and death, and the impersonal cruelty of state power. By so doing, he created a link for himself to not only the pessimistic humanism of Goya and Picasso, but, more importantly, to Abstract Expressionism and its existential and metaphysical concerns -concerns which had been mostly abandoned by the artists of the 60s" (P. Halley, "Fifteen Little Electric Chairs," Andy Warhol Little Electric Chair Paintings, exh. cat. Stellan Holm Gallery, New York, 2001, p. 40).